kandeej.com: What's So Special About A GLAMINAR? A GLAMINAR is nothing like my yotube videos..well, they sort of are because it's me, but you will learn things I never teach in any youtube video- this is WAYYYYYY more than make-up....this is something that is changing people's lives....why?!? What most people don't know is what awaits you at the Glaminar... it's not the silver gift bags I designed (that are pretty awesome), it's not the goodies in your gift bags.. Yes, I know tricks from make-up masters that have taught me, as I apprenticed them on movies and shoots...yes, they are things that I don't have time to teach people in my youtube videos. Some things you just have to have a person in front of you to teach and explain. No, this is not like any make-up seminar or class you ever find anywhere. No you are not gonna leave with just some tips on how to put your eyeshadow on better. No, this is not like my youtube videos...this is an experience that is NOTHING like watching a youtube video can come close to! *HOW TO BE SUCCESSFUL AT ANYTHING! *You'll learn my tips and tricks for success, happiness, and how to overcome hurt & failure....and so much more. You get business forms and papers to set up your business, as well as a legal contract which you will give to clients to make sure you get paid, which can cost over $500 to have written up by an attorney (this is not some generic contract you copy from online), and I give this free because I don't want you to loose money like I have without it! You leave ready to start your new career...start making money. I get comments all the time: "why does your glaminar cost so much money?" This is cheaper than spending your money on make-up or beauty school where you'll spend from $6,000-25,000 and still have no way of making money or knowing the tips that I teach you for success. try needing to come up with over $3,500 for a room to rent to hold it in. Then another $1,000 for a sound man so everyone can hear me. The lighting equipment can cost up to $1,000 too! I have to pay for the big tv screen so everyone can see the details....even more hundreds and hundreds. The chairs alone can cost $1,000! The stage platform so everyone can see can cost up to $2,000! That doesn't even include the cost of the bags I had made to give you guys, the hundreds of dollars for cupcakes and decoration. The hundreds of dollars in shipping to get all the things there in time, the gift bag goodies and prizes! This doesn't cover the cost I have to pay for all the people to set up and tear down the event, that can cost another $1,000. The printing alone of the certificates and the pro class hand-outs cost hundreds of dollars. It is VERY, VERY EXPENSIVE....and sometimes I wonder if we'll even make enough money to cover our costs. But I do this to inspire you all! To change your lives and give you hope for an AMAZING future! Tears are shed, laughter is felt in the room, lives are changed....you know more about make-up and beauty than ever......hearts are sparkly with beauty...success is with you...and confidence is huge when you leave the GLAMINAR! you can read the testimonials from some of the girls on the glaminar website to see what how it changed them! this is an investment that for your life, that will really change your future...this is not just some class...if you want just a basic make-up class....this might not be for you...if you want to change your life and learn how to go after your dreams...and love what you do....than this is it! Hope to hug you and see you there...and get to speak to your heart! Come to Denver! I've love to come to a Glaminar! I hope I can get to a Glaminar, maybe not this year....please keep doing them so I can get to one. :) In Ohio would be great. Maybe I can make it to the one in NYC, but money's a little tight because I'm starting as a freshman in college this fall. Hope I get to see you sometime! I just discovered your blog and I am addicted!!!! You give such a great advice and have beautiful energy! I was wondering if you could do a makeup demo on someone with light skin and blonde hair. Maybe recommend some colors and looks! Thank you for all of your hardwork! Can't wait for the one in Miami! people don't realize that you're spending so much time on the glaminars.... it's your life and profession... and it's taken you all this time to learn what you will teach everyone. So people need to get that the chair people and people who own the building etc. etc. all make a living on this too. It's the creative people that don't necessarily work 9-5 but more like 9-midnight or 2 am haha. It just goes with he profession. 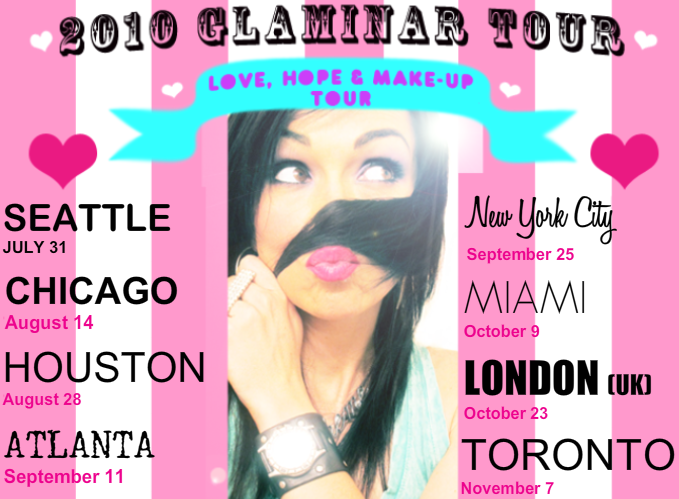 I wish I could go to a glaminar!!!! 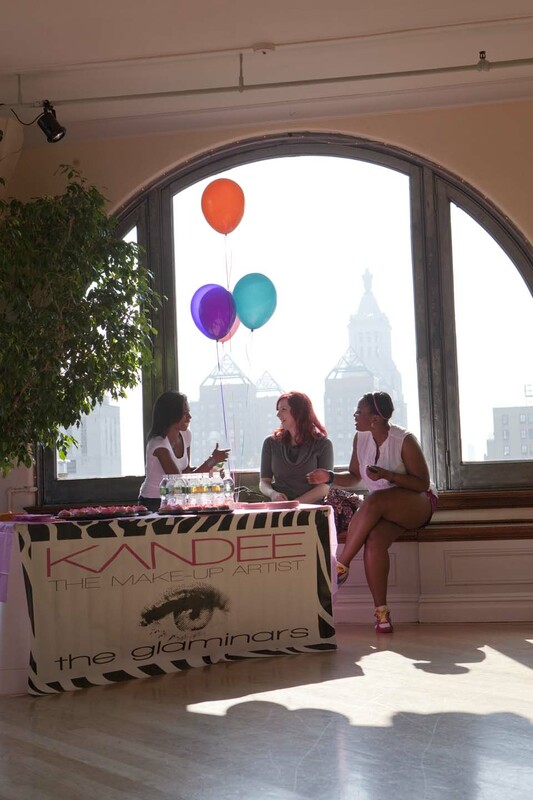 Kandee I cant wait to met you and come to your glaminar next sat. I have told my husband for over a yr if ayou ever come to chicago that i am so driving the three hours.. I really think it is an answer to a prayer and by Gods grace i was able to come! Thank you for allyou do for us.. I will pray you have a safe trip and it will be great see you soon. Thank you Kandee you are amazing!! You are too fabulous, Kandee, and I admire you for that. You're a perfect role model! I hope you come back to LA area next year, I will so totally go!!! Dearest Kandee, thank you so much for the detailed info. I do appreciate it. I'm new to the internet & the *Kandee Krew*, n I started following you religiously, right after your LA GLAMinar. Please come back to LA, do your show, n definitely write a book. I'm usually not a hugger, but I definitely want to hug You. You made me smile at a time I was so sad, you turned my frown upside down. Thank You so much! I think you have been here before....but come to Vancouver, BC Canada again please!!!! I would for sure go! oh Kandee! The one weekend I can't come to your glaminar, the one weekend...haha. I just recently moved to NYC and when I saw your Glaminar post for NYC I got stoked...and started thinking about it, but then realized it's the one weekend I'll be out of town. Have a blast! Maybe next year.........................? You inspire me alot :)thank you very much kandee and i hope you wont get tired of inspiring everyone..
i would love to go to one ! it must be an amazing experience ! but unfortunataley i don't have enough money ;-( heh maybe in next years i will have a chance to go to one. Come to Athens- Greece!!!!! I would love to attend one of your glaminars. I just wanted to say I CAN'T WAIT TILL YOUR MIAMI GLAMINAR!!! You have inspired me so much since the first time I found one of your videos on youtube. I went to school to be a cosmetologist and I have to say its something I'm good at but I HATE IT!!! All I want to do is wake up every day and do makeup and help make people feel more beautiful.. You help to motivate me everyday and help me to want to be a better me..I hope with all the motivation you have given me I can finally pick up and move to LA in the next year and half..
Love you Kandee your the best..
YOU SAY MAYBE YOU WN'T BE ABLE TO COVER UP YOUR COSTS OF GLAMINAR THEN HOW DO YOU PLAN TO TEACH US GAIN MONEY AND HAVE SUCCESSFUL BUSINESSES IF YOURSELF YOU DON'T KNOW HOW TO DO IT??? I hope to see you when you come to New York. I think this is a really beautiful thing that you have going. Keep it up darling. 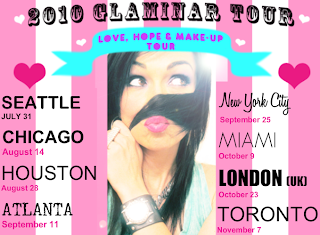 I Hope I can make it to your Miami Glaminar! Kandee did you shoot your latest glaminar video in downtown Louisville, Kentucky? I swear those buildings look familiar. If so, I live 5 minutes away! You're awesome, either way. when will you be in california?? if i can make a living looking beautiful and enjoying it instead of my 6am-3pm long distance drive to the bay area from the valley tired as heck and sitting at a desk all day, i'd love to take the oppurtunity..God bless you for the great things you do for everyone kandee..you have so much good coming your way..
Hopefully you will add San Francisco to the list in the near future. Kandee, your encouraging little messages at the end of your videos break my heart - in a good way. How do you do that? I spotted that cuff that you wear that I LOVE! In the 7th pic of this blog you are wearing it... where can I find it? ?